Training is improving. A few weeks ago, 60km nonstop were still quite exhausting, now I have enough energy to go for a hilly 60k ride and go horseback riding in the same day. By March I need to be able to do 200k a day, but I’ve still got quite a way to go until then… You gotta start somewhere. I’m hoping that winter won’t be too harsh this year, keeping me on the roads as long as possible. Along the same lines, I’ll be upping the amount of strength training. Cleaning the stable and horseback riding is already good for my core and arms, but it is not enough. There is still a lot to figure out – mainly the funding, but also the exact route, gear and the flights. Luckily I do have tons of time to think about these things and still train every day. Will my friends believe it? Probably not. In the past, I haven’t been the most disciplined person and I’ve always been on the “chubby” side. Not really chubby, but quite womanly, and you could definitely tell how much I love cooking and eating. I still do. But I came to realize that instead of being jealous of other people realizing their dreams and living a live they are proud of, I need to figure out what my life is for and do things I can be proud of. I live vicariously through the accounts of other people’s adventures – but there is no reason why I can’t be as adventurous! Time to go out and DO stuff! 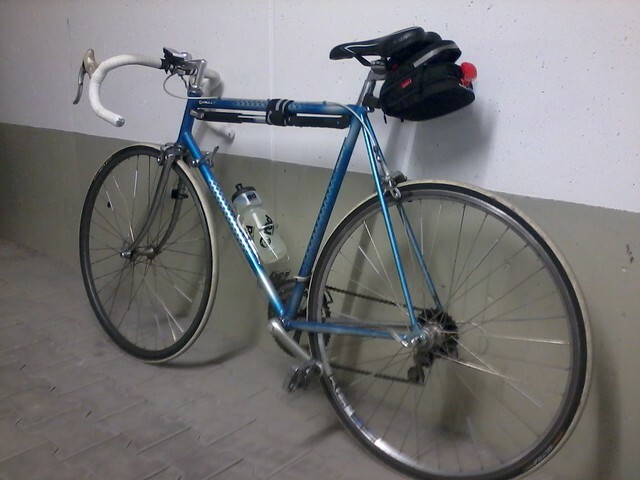 By the way, this is my trusty steel steed, which used to belong to my Dad actually! That’s a Staiger Cavallo III with a Shimano 105 groupset, standard 700x23c road tires and a cheap replacement saddle (the original one was white to match the bar tape but it felt like sitting on a sharp rock). I also added SPD pedals instead of the original cage ones.